Until I recently read Home Dairy by Ashley English I had no idea there was such a thing as cultured butter! I don't know why I never thought of it before, pretty much all forms of dairy come as a result of some sort of culturing/fermenting as a way to preserve the nutrition of milk. I have only ever had 'sweet' butter so it never really occurred to me that my butter might offer a dose of pro-biotics like my yogurt does or that it might have a slight tangy flavor instead of being sweet and mild. 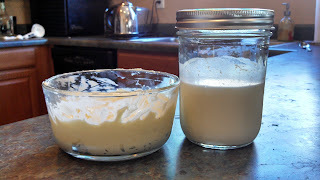 I have been unable to find cultured butter or 'European butter' in the dairy case of my local grocery or health food stores but luckily it is super easy to make at home! A pint heavy whipping cream - get the best quality you can find, if you have access to good quality raw milk even better, skim off the cream and use that - I used organic valley pasture raised cream. One heaping tablespoon yogurt with live active cultures - try making your own! 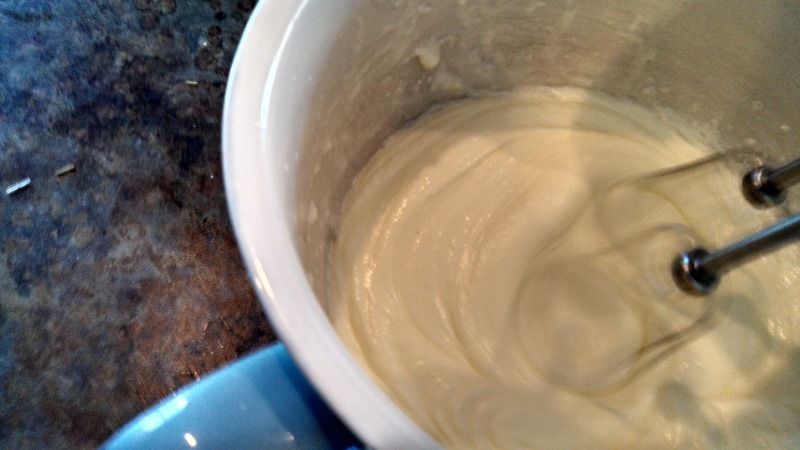 Stir yogurt into cream in a clean glass jar. Cover with lid and let sit at room temperature for 24 hours. - TaDa! You now have cultured heavy cream! Knead and squeeze the butter until you have pored off all the butter milk, really work it. 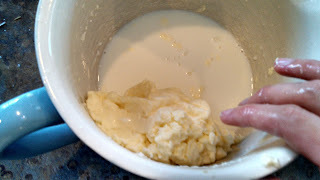 To preserve the flavor mold butter into a log, wrap in wax paper and store in the coldest part of your fridge, usually the very back, not the butter compartment in the door!- forgive me, I skipped this step and just stored mine in the back of the fridge in a glass bowl with a lid but it held up fine. There you have it! 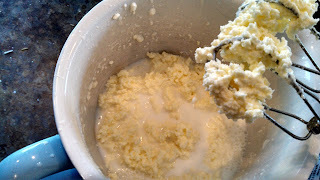 Homemade cultured butter and buttermilk! Cook with your cultured butter for a slightly tangy butter flavor or dab (glob even) it on your steamed veggies for a dose of pro-biotic goodness! Yummy! This post is a part of Fight Back Fridays at Food Renegade. Go check out all the other tips and recipes by other real food bloggers like me! Love it! Gonna do this. My kids adore butter (we all do, really), but this would be a fun and healthful project. Thanks! 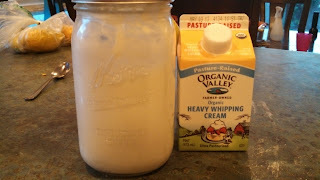 If you are going to do this as a project with your kids instead of using a hand mixer or food processor it might be fun to put some of the cultured cream into small jars for each of them and let them shake, rattle and roll the jar until they get their own personal butter! 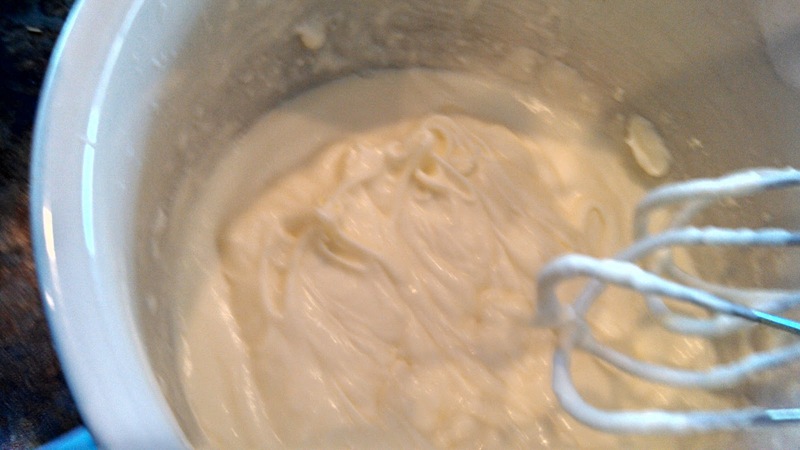 It will take longer that way but they can be more involved with the process and really watch the cream separate into butter and buttermilk.